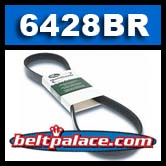 6428BR Gates™ BladeRunner® Belt. Outdoor Power Replacement Belt. Exact OEM fit and construction means more value and longer life. Withstands the rigorous start and stop operation of lawn and garden equipment.